Use any data source as your email marketing list by using IntelliClick Any Source. 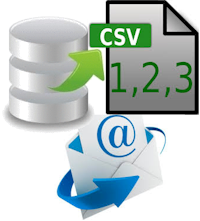 Generate a CSV or Excel file of your target audience information and use it as the source for your customized and personalized email campaign. Virtually any ERP, accounting, CRM, spreadsheet or other address book applications such as Outlook can be used as your source. No need to upload your data, so it is always securely stored within your system. Use any exported fields to personalize your messages. Email templates, created with the IntelliClick online editor, allow you to prepare professional grade messages, quickly and easily. Reporting is available on demand, or automatically delivered by email at time intervals and to recipients you designate. A special web site page navigation feature adds to the power of your campaigns, sent directly from your PC. Benefit from "digital body language" to prioritize recipient interests in each of your campaigns. View our brief product overview video to learn more. The IntelliClick Hyperlink Building Wizard streamlines the preparation of the email template and special hyperlinks. Each link has intelligence tied specifically to the campaign and the web page to which the recipient is directed.